SATURDAY and Sunday should both be worth looking for a fish. The forecast is pretty good before an expected spike of 25kn Sunday night and dropping to 10kn by Wednesday. There were some nice captures this week from the estuaries and offshore. The Fitzroy, as usual, is going quite well, from the barrage down to the delta. Lots of reports of barra and king salmon, with a few grunter around too. Whiting fishers are reaping the benefits of a better-than-usual run in a few different spots along the coast. The creek mouths and sand bars from Long Beach all the way up to Three Rivers have been fishing well lately. Blue salmon have been landed in many of the creeks lately, from The Narrows, Pumpkin Creek, Coorooman Creek, The Causeway, Ross Creek and Corio. Plastics and livies are doing the job. The pick bait is yabbies and a good place to start looking is around the yabby beds in any of the creeks. Whiting fishermen reckon that whiting fillets beat nearly everything else for blue salmon, which explains why they are present around the creeks at the moment. Try whole ganged pillies in any of the washy areas at Sandy Point. Mackerel were chewing well over the bigger tides this week. 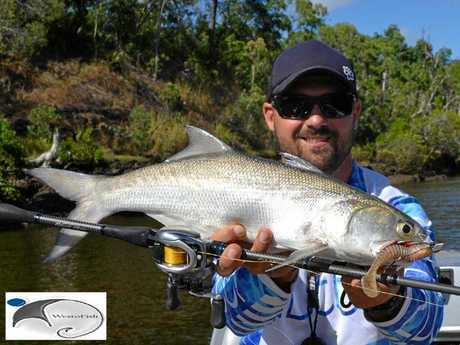 Around the islands and the few spots north of Yeppoon are producing some nice fish. There should also be a few doggies at the islands and wider patches. There have been plenty of quality fish about, including red emperor, sweetlip, coral trout and largemouth nannygai. 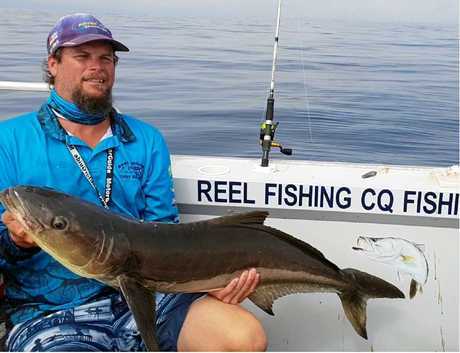 Cobia have had another squirt as reports of large schools have come from some of the wide patches. 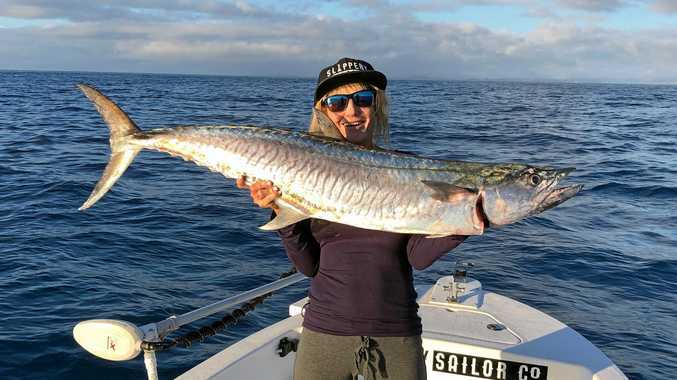 They have been taking floating pillies and other baits meant for mackerel and reefies. While they are in feeding mode they will near grab anything but when things are quiet bait presentation is everything. We still need heaps of emails sent to the council and all levels of government in support of additional boat launching facilities away from Rosslyn Bay Harbour. We keep getting a raw deal and the only way to get the situation improved is to keep pushing and prodding them. If we get enough momentum they will have no choice but to listen and react. Thanks to Bluefin Sports, Kalka Bait and Tackle, The Secret Spot, Rosslyn Bay Kiosk, Stanage Bay Marine and Cooee Bay Marine, the locals who not only support the fishing column but also the fishing and boating community across the whole of CQ. Send your emails or photos in to be eligible for the next $50 voucher draw. In the next couple of weeks we will have a double draw of two $50 vouchers, with all photos submitted in the last year going into the hat.